A CENTURY-OLD clause in a trust deed could become the focal point in a row over a housing development. Plans have been laid to demolish Broadway Garage in the centre of exclusive Darras Hall and replace it with flats and townhouses. But one clause in the Northumberland estate's 1910 trust deed says "terraced dwellings were expressly and specifically to be avoided". It is also claimed that local rules say the filling station, built in the 1960s, should be in place for 100 years. The Darras Hall Estate Committee, which has its own set of established regulations, says the terms of the lease precludes the use of the site for residential purposes. The dispute is due to come to a head today when Northumberland County Council's area west planning committee meets in Hexham to decide on the application from Roadside Group Ltd to build 15 two-bedroomed flats and five three-bedroomed townhouses in place of Broadway Garage. Twenty-four written objections have been lodged with planning officers who nonetheless are recommending conditional planning permission be granted. Ponteland Civic Society believes the proposed buildings will be "out of keeping" with the immediate surroundings. Chairman Philip Ham said: "The trust deed is something the owners very rarely get to look at in its entirety though the estate committee produces a summary book every so often. "But the civic society feels if there were some better scheme rather than have this high-density one, we could possibly take a different view. But the plans for this are very high-density." Zara Commercial Ltd, the owners of the Broadway Shopping Centre, lease the site to Roadside Group Ltd but are opposed to the housing development plan. Their solicitors, Dickinson Dees, have written to the council to say: "The byelaws explain that in 1910, a group of landowners and businessmen created the concept of a residential estate to allow people to live in a more rural surrounding rather than in long streets of terraced houses and flats. "The byelaws state that it is important to ensure the overall rural ambience of the estate is maintained. They are a separate regime to planning which also must be complied with. "To maintain a rural ambience, a lower density is required than that proposed with the current application for the garage site. "There is very little open or green space, creating a high-density urban development which is out of character with the area and contrary to the principles of the Darras Hall estate and its byelaws." Other objections say the "flat and unattractive" courtyard-style development would cause traffic congestion, overcrowd the area, and at three storeys is too high. 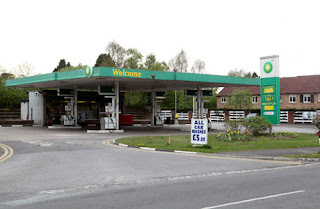 There is also a risk of contamination in the land after its long use as a filling station. But planning officials say there would be contamination checks on the site before any work starts. Around 40% of the buildings would be "affordable", the impact on neighbouring amenity and highway safety would be acceptable, and the planners' report concludes: "Subject to recommended conditions the proposal would be acceptable." Roadside Group Director Colin Fullerton was unavailable for comment last night.